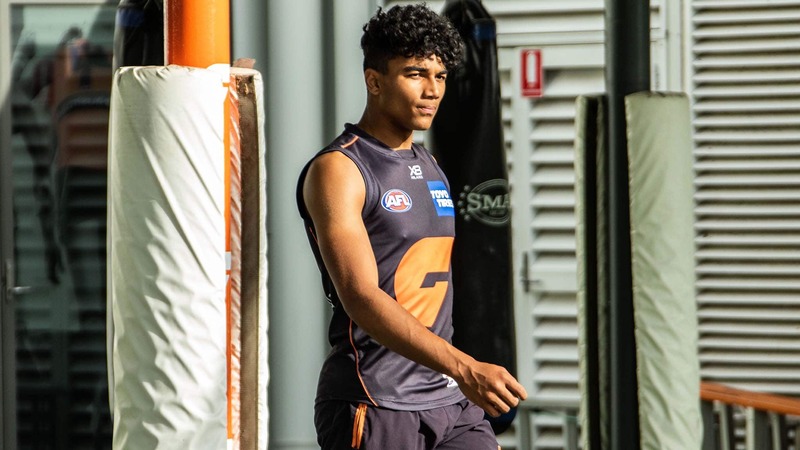 IRISHMAN Callum Brown spent his first few minutes in Australia in July explaining to Giants list manager Jason McCartney what it meant to break someone's ankles. The reference, of course, has nothing to do with injury, as basketball fans will know full well. Greater Western Sydney's second-ever Irish AFL recruit had whipped out his mobile phone soon after landing to show McCartney his stunning Gaelic football goal from the same month. Brown, 18, swooped on the ball, used fancy footwork to shake his opponent – who tumbled helplessly to the ground – then blew past several rivals to smash the ball into the net. The 189cm, 91kg teenager, of African heritage, packed all of his many attributes into those 10 seconds of brilliance. He projects as a forward, but will probably start in defence. "I didn't quite understand what he was talking about when he talked about breaking a guy's ankle, but that's their terminology when they wrong-foot someone," McCartney told AFL.com.au with a laugh. "He's a powerful athlete and has some really explosive power. He's got some things to work on, but he's really dynamic. "Obviously, (coach) Alan McConnell's had Cora (Staunton) in the AFLW, but in the men's component it's the first time we've gone down this path with an Irish recruit, so we're really excited about it." Brown's two-year deal makes him the fifth Irishman to commit to an AFL club in 2018, behind James Madden (Brisbane), Mark Keane and Anton Tohill (Collingwood), and Stefan Okunbor (Geelong). Those arrivals ensure there will continue to be a strong Irish contingent despite Lion Cian Hanley, Carlton's Ciaran Byrne and Cillian McDaid, and Saint Ray Connellan retiring or being delisted. Brown swells the AFL's Irish playing presence to 13, while another Irishman, Jordan Morrissey, has strong interest from both West Coast and Essendon. Two other Irishmen, Red Óg Murphy and Oisín McWilliams, Tohill's cousin and an under-20 Oak Leaf teammate of Brown's and Tohill's, spent a week trialling with North Melbourne in August. Tohill, Keane, Morrissey and countryman Pierce Laverty tested at the NAB AFL Draft Combine in early October. The Giants were already eyeing Brown in December last year, three months before McCartney officially started at the club. A now-former GWS assistant coach, Irish-born Nick Walsh, who spent three seasons on Melbourne's rookie list without playing a game, was the conduit. He tipped Brisbane off more than a decade ago about current Gold Coast defender Pearce Hanley and was also responsible for Staunton arriving at the Giants. Walsh and star defender Heath Shaw spent time with Brown around Christmas before he returned with McCartney in March to watch their prospect in Gaelic action. A 10-day trial followed four months later, and the Giants were suitably impressed with the County Derry man's athleticism, game sense and ability to draw an opponent. "We're dipping our toe in the water and we think we've got a really good athlete first-up to get to work with," McCartney said. "The Category B (international rookie) option is there, so we're maximising the potential with our list. "With our Academy and NEAFL team, we think we have a really good pathway we can develop players in, but it will be a bit of a learning experience for us as a club. "Getting Callum a bit earlier than some of the other boys who've come out maybe gives us a bit more of a chance (of him making the grade)." The AFL will hold its three-day European Combine in Dublin, Ireland, from November 29 to December 1, with up to 25 Irish hopefuls to be measured, tested and take part in match play.